Bolivian cuisine reflects a blend of indigenous peoples and European colonization. With a mix of large urban cities and vast rural farmlands, visitors to Bolivia are apt to find common Hispanic foods such as empanadas and chorizo alongside more unusual fare such as dried llama meat and fermented corn beer. Bolivian menus reflect the country's natural abundance of spices, grains and vegetables. Breakfast is a quiet affair in Bolivia, consisting of a cup of coffee and a bowl of soup or bit of bread and cheese. Along with coffee, another popular breakfast drink is api, a hot corn drink flavored with cinnamon or nutmeg or other spices. Breakfast is often taken as a mid-morning snack. Salteñas are a popular Bolivian food commonly eaten as a morning snack. 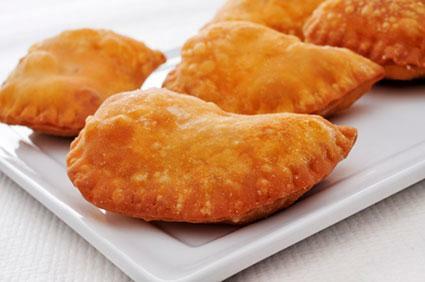 These turnover pastries, similar to an empanada, are filled with meat, cheese, and boiled eggs and then baked or fried. Salteñas are so popular, that they are the main menu items for many Bolivian restaurants. Lunch, called almuerzo, is the most important meal of the day in Bolivia. In keeping with the European custom of siesta, lunch in Bolivia is typically a three hour affair, usually from noontime to 3 p.m.
Fricase: This is a thick, chunky stew made with spiced pork or chorizo sausage. Fritanga: This pork and egg stew and may be seasoned with garlic, parsley, oregano or cumin. Sopa de mani: This popular soup is made from peanuts and meat. Fried potato strips, similar to French fries, are a common side dish for sopa de mani. Chuño phuti: Chuño phuti are freeze dried potatoes. Potatoes (chuño) have been eaten in Bolivia since the time of the Incan empire and are still a staple of the national diet. Between Bolivia and neighboring Peru there are over 10,000 potato varieties available. 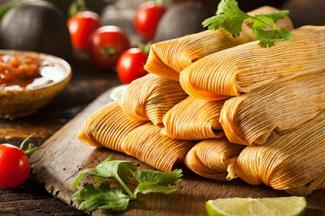 Humintas: A sweeter version of a tamale, this dish features a seasoned mixture of ground corn wrapped in corn leaves and steamed. Other common side dishes found at a Bolivian lunch include quinoa, rice and corn. Unlike spicier Mexican cuisine, common Bolivian food tends to be quite mild. However, ilajua a popular spicy sauce, is used to add heat and flavor to dishes. In Bolivia, known globally as a producer of gourmet teas, tea time is taken around 4 or 5 p.m. Common choices for tea, or té, include classic black tea or yerba mate, a tea made from the leaves and stem of the yerba mate plant. In Bolivian cities, many tea houses serve pastries, including more salteñas or cuñapés, a cheesy biscuit made from yucca (tapioca) flour. Dinner is traditionally eaten later in the evening, around 8 p.m. The menu is similar to that of lunch, but much smaller. In cities, dinner is often a time for conducting business or socializing and meals may be taken at a restaurant. 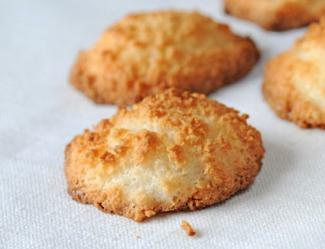 Cocadas: These popular Bolivian treats are similar to coconut macaroons. Charque de llama: Dried llama meat is fried and served with stewed corn, cheese, and boiled eggs. Chicharrón: A popular snack dish in Bolivia, chicharrón is made from pieces of fried pork fat, garlic, peppers and spices. It might be served with chicha, a fermented corn alcohol that is country's main alcoholic beverage. Bolivian dishes have remained rooted in history, relying on staple crops like potato and corn. Influences from Europe and other Latin American countries have resulted in many unique foods that are a part of Bolivian culture.